*Buy one carton of Breyer’s ice cream and get a free 18-count package of Scoopy Rainbow Cups. Save $1.00 off NorPro EZ Grip Ice Cream Scoop. A brilliant blend of Portuguese grape varietals with hints of strawberry, cherry and a slight spritz! 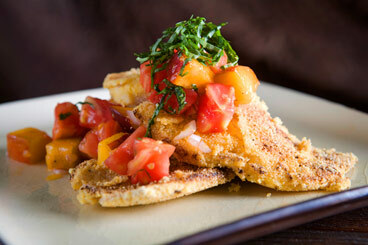 Serve chilled on its own or pair it with our featured recipe, Cormeal-Crusted Tilapia with Peach-Tomato Relish. Check out the new beauty line in our healthy living department: Love & Toast by Margot Elena. With fragrances like Candied Citron, Honey Coconut, Gin Blossom and Mandarin Tea, this line just screams, “Summer’s here!” Try the roller ball perfumes, little luxe eau de perfumes and hand creams. Eat! Drink! Party!...all in support of the Sacramento Zoo and the zoo’s various educational and conservation programs. Our Florin Road Nugget Market hosts a wine-tasting table at this year’s King of Feasts, teaming up with local wineries, breweries, and restaurants. It all happens on Saturday, June 26 at the Sacramento Zoo, from 5:30pm - 8:30pm. For more info, visit www.saczoo.com. Prices valid 6/23/2010 - 6/29/2010. Try this delicious recipe featuring tilapia, on sale this week for $6.99/lb., save $2/lb. 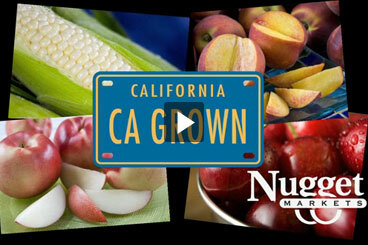 It also features California-grown organic peaches for $1.97/lb., save $2.02/lb. Take a trip through our produce department with our director of produce, Adam Bazarnik, and discover some of the delicious California-grown summer produce available now. Ice Cream Sundaes: Dark Chocolate Banana or Caramel Pecan with vanilla ice cream, whipped cream and a cherry, $2.49. Apricots: Three lusciously sweet apricots supply almost 80 percent of the Daily Value for vitamin A as beta carotene, which helps promote both eye and heart health. Berries: Raspberries, marionberries and other summertime berries are sweet nutritional delights with each one-cup serving supplying over 50 percent of the Daily Value for vitamin C, along with the minerals manganese and potassium, needed for heart health. Cherries: These sweet orbs contain the same anthocyanidin compounds as blueberries, giving this fruit its strong antioxidant capacity, helpful in fending off age-related diseases like cancer. Corn: This must-have summer vegetable comes with a wealth of nutrients, notably folate, a B vitamin that is crucial for a healthy pregnancy and protecting your heart and circulation. Nectarines: One medium-sized juicy nectarine has a mere 60 calories and comes loaded with potassium, vitamin C and carotenes (orange-colored pigment). All of these nutrients are key in supporting heart health and a strong immune system. Peaches: A fuzzy relative of nectarines, peaches supply an orange-red pigment called lutein that studies show helps protect eyes from age-related damage. Plums: Deep red and purpled-colored plums contain phenols, which studies show protect against oxidative damage that may lead to degenerative disease, including Alzheimer’s and cancer. Heirloom Tomatoes: Abundant in the summer in all shapes and colors, these tomatoes provide a wealth of colorful pigments that act as potent cancer fighters. Regular consumption of tomatoes and tomato products, such as tomato sauce, may help lower prostate cancer risk.